Nicholas Briggs was intimately involved in every facet of the first series of Cyberman, writing and directing all four instalments while also scoring, working on sound design, voicing the eponymous foes, and fleshing out a backdrop introduced in his own earlier story ‘Sword of Orion.’ However, with Briggs’s promotion to producer of Big Finish and the increased responsibilities that ensued, James Swallow stepped in as writer to continue the saga with the long-awaited follow-up some four years later with the appropriately-titled Cyberman 2. With the opener ‘Outsiders’ set six months after the conclusion to the first series, Earth has fallen to the Cybermen as legions of the silver figures stand guard in every city across the planet as a web of lies and deceit draws tighter and the lines between enemy and ally continue to blur. Paul Hunt has assumed the position of Executive in Chief and has extended his term in charge to help secure humanity and to find android infiltrators within the Earth forces’ ranks while simultaneously increasing SCU numbers on the streets and allowing them to become ever more blunt as they begin imposing mandatory curfews in areas of alleged terrorist activity and forcefully imposing their will. All of this comes to the forefront as a burgeoning distrust for the so-called ‘Tinnies’ begins to more overtly manifest, people unnerved by the identical suits and identical voices with no visual acknowledgement of who stands within the armour. It’s through the eyes of cab driver Hazel Trahn that the audience is introduced to the notion that certain individuals on Earth believe that there is a conspiracy in which facts regarding the SCUs’ actions are being altered for public reports and that the media with its oversight is no longer a reliable source of information. With her sister the victim of an accident long ago, it’s also made clear the extensive perks that are promised to supposed volunteers to entice them to join the SCU programme, a brazen lie given that the Cybermen know that they have already conquered Earth and are simply consolidating and reinforcing their ranks to remake Earth in the image of Mondas. As Hazel unwittingly finds herself in the presence of a ragtag resistance group, Swallow also finds time to continue the story of Liam Barnaby and android Samantha Thorn as the two are rescued from their derelict and stranded ship after developing an intimate bond in which she is willing to sacrifice her own power reserves in order to prolong life support systems. With a military group co-opting a civilian ship, the leader Louis Richter shows that old grudges and preconceptions are just as prevalent as ever, boldly stating that android spies and sympathisers are the true problem even before accidentally learning that Samantha is an android herself. Showing no remorse for anyone and declaring martial law on the ship, Richter instantly proves himself to be a powerful force that leaves Liam in dangerous territory as Samantha barely escapes the ship with her life. With paranoia and tension amplifying on all fronts, ‘Terror’ shows an Earth trapped between oppression and destruction with dangerous truths yet to reveal themselves. As Samantha connects with android control and learns of her species’s plan to deploy a planet-killing Eclipse-class device to eradicate all organic life on Earth where a Cyberplanner is rooted, Barnaby finds himself a prisoner of war under Richter who is becoming increasingly fanatical in his pursuit with no regard for boundaries or morality. Exactly because of this change and the fact that everyone was as equally fooled by Samantha’s identity as Barnaby, the crew of his ship has begun to lose faith in his impassioned dedication, the two officers Taggart and Chessman releasing Barnaby, the only other officer on board, in order to lead a rebellion as military rules dictate and require. As frictions intensify and a power struggle ensues that ultimately sees Richter succumb to disinformation soiling his reputation, Barnaby becomes equally disturbed by Richter’s mentioning of a cyborg rather than limiting his obsessive speech to synthetic androids, realizing that the problem behind this war may be far bigger than anyone has yet anticipated. The Cyberplanner at this time has ordered an increase in conversion rates, a problem for Hunt who must now strategize how to maintain his plausible deniability that is already being stretched to its breaking point. There are planned skirmishes to help thin out the resistance numbers in piecemeal fashion, but Hunt realises that the discovery of Hunt’s survival is one that he can use for political posturing by branding this one-time hero as a traitor and an enemy sympathiser. Within the resistance itself, Hazel finds it to be far less organized than Hunt’s fearmongering had suggested, told that most people choose to keep their heads low rather than stand up to what they notice around them. Soon branded as public enemy number one for an apparent act of terrorism, however, she has a newfound desire to learn the truth and wedges her way into the next mission that takes them squarely into a branch of SCU operations where the truth lays in wait. With the conspiracy of hate and distrust bringing death in its wake in ‘Machines,’ the menacing plans of the Cybermen are revealed in full as a handful of rebels must learn to trust themselves if they have any chance of succeeding. With the horrifying truth of what is happening to humans to create the so-called SCUs now known, Hazel hopes to take the fight back to their furtive captors, hoping to blow up their conversion plants in order to stymie their amassing of numbers. After convincing her that this course of action is a suicide mission with little chance of lasting success, Yan and the underground soon come upon Samantha who instantly proves her value with decoding and mechanical prowess. It’s a logical if somewhat convenient means of bringing two threads together, but her advent for a logic bomb or computer virus to thwart the Cybermen whom she knows all about is an intriguing counterpoint to the more action-minded human plan of devising a way to murder Paul Hunt whom they still view as a key component of the problem. Once more, Samantha finds herself surrounded by humans whom she implicitly knows will not trust her if she reveals her true identity, and Hannah Smith continues to play that tightrope-walking aspect of her character aptly. Strangely, though, Samantha describes the Cybermen as being figures who have erased all emotions except for hate, a gross mischaracterisation of the completely emotionless beings that can be forgiven coming from one character given her experiences but one that is confusingly mentioned time and time again. Still, ‘Machines’ does successfully manage to overtly introduce the foes on multiple fronts, and Barnaby accessing Richter’s logs pertaining to a potential spy on board and finding that someone has sloppily attempted to erase the data is a strong character moment for the hero seeking redemption. Although he initially follows through on Richter’s assumption and blames Taggart, the facts soon reveal that Chessman- as if the name was not a blunt enough giveaway- is in fact a Cyberman-human hybrid, or Cybrid, who has been carefully guiding events. Given Barnaby’s own experience with conversion, this revelation leads to a poignant discussion about the differences between these two characters as Chessman almost seems to revel in his newfound state. As the Cyberfleet advances and Barnaby is tried in absentia and convicted of war crimes with sentencing set back on Earth, the scene is set for a converging finale of immense scope. In the concluding ‘Extinction,’ only one race can emerge victorious in the war for the future where fear is a primary weapon and the Cybermen follow and pursue ever more logical courses of action. Barnaby has been sentenced to public execution to send a strong message to any other dissenters on Earth, and fittingly his only regret is what has been left unsaid between Samantha and himself. However, a rebel assassination attempt on Hunt’s life during the execution ceremony proves to be the pivotal moment in which the narrative is completely upended. Barnaby Edwards has done well to portray Hunt as a man who is continually becoming more stressed and obsessed with maintaining power, and though his more emotional actions have been met with support from the general population and others in power, it’s clear that his once-unchallenged support is beginning to fray. Unknown to Hunt, the Cybermen had predicted that the assassination attempt would occur, and his presumed death would have fed into their misinformation strategy immensely well to further their cause; with his life now superfluous and his emotional state seemingly compromised, the Cybermen prove once more that nobody is above their own plan no matter assumed individual importance, making him their latest member. As in the first series with Karen, Hunt remains recognizable to others after his conversion, a fact that again blatantly goes against everything that the Cybermen stand for, but it’s an established facet of this miniseries nonetheless and so not completely out of place in that respect. With Barnaby reunited with Samantha in the underground after his rescue, it truly is Samantha who steps to the forefront, using everything she has learned about the incessant willpower and illogical actions of the humans to formulate and adapt a meaningful plan. With the androids’ all-powerful destructive plan still hanging in the air, even self-sacrifice is a step she is willing to take, and her eventual confrontation with the Cyberleader in which she discusses the resolve of humanity and the ultimate cost the Cybermen will incur in this lengthy war of attrition compared to resource expenditure is a suitably practical but powerful one that brings aspects of all three races into the fold nicely. It does seem odd to hear the Cyberplanner concede defeat by admitting that they have made a tactical error in placing so much importance on Earth given its relation to Mondas, but it does provide for a nonetheless logical turning point for this series even if events here are the ultimate conclusion. 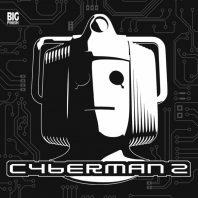 Questionable characterisation about the emotionless status and conformity of individuals converted aside, Cyberman 2 overall is a strong continuation of the story started so long ago that weaves together related but disparate storlyines and that features a surprising conclusion and coda. Nicholas Briggs excels as always with his Cyberman voices and provides a steady hand with directorial duties, and James Swallow has managed to recapture the tense desperation of the first series admirably. Although the Cybermen themselves are somewhat more passive than might be expected in a series in which they are given title billing, the overall converging narrative of the Cybermen, androids, and humans is an engaging one that still has plenty of potential going forward given Cybermen’s propensity to arise in every civilization and spread so mercilessly across the cosmos.